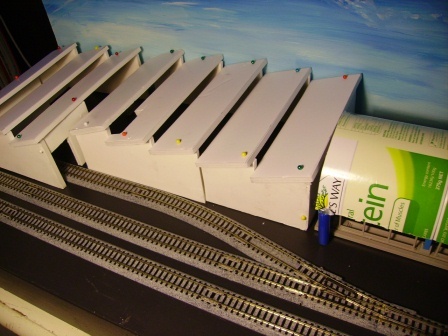 Description: The ANR (Australian National Railway) Workshop was the second double module that I have built. It was constructed over an 18 month period. The double module has always been a area I wanted to model, but I found that the larger the space left me way to many modelling decisions. I decided to use foam board and make some model roughs to experiment with the layout. 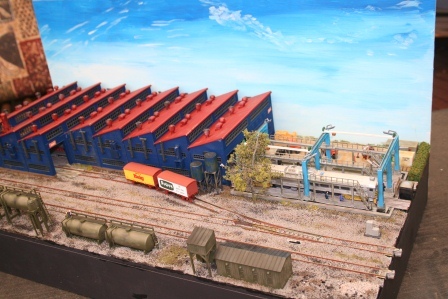 The workshops have one active siding off the back track, and two scenic rails through the sheds. 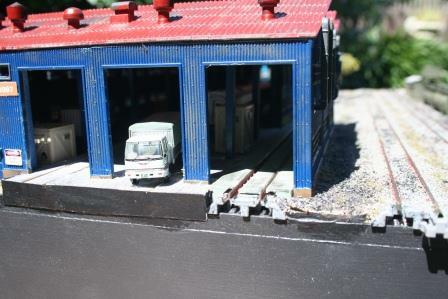 The large shed was a kit bash from 4 separate Greenmax sheds, that come from the Japanese model market. 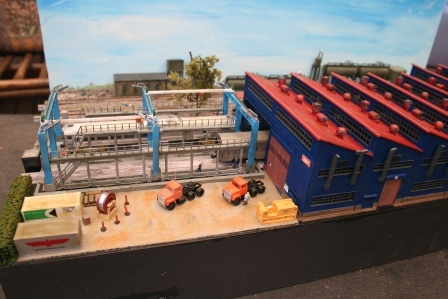 The repair and wash gantry was a part of a Kato engine shed. It had really good blue steel pylons and unique walkways that I thought would make a visually interesting scene. I made up a ANR Budd railcar RD1 from a very old ConCor kit. It painted up very neatly an with the addition of a decal set from SAR NSCALE DETAILERS a local Australian manufacturer. As I spent a lot of time on this module many areas of my modelling changed. In particular I saved up and purchased a Digitrax DCC system, so I made a decision to make as many of my modules powered so that I could get the track voltage even as my out and back module length was getting close to 14 metres in total. So this module has double power drops on the rear panel.